Take a tour behind the scenes of the world famous Quay Street set. Coronation Street - The Tour, Atherton Street, Manchester, M3 4FD. Take a tour behind the scenes of the world famous Quay Street set. Studio guides will share fascinating facts and stories from over fifty years of filming at the site, before the production moved to its new home at MediaCityUK. Coronation Street The Tour is open for a limited time so please book early. 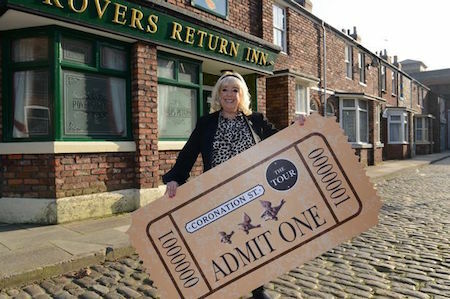 Walk down Coronation Street on the famous cobbles and have your photo taken in front of the Rovers Return. Visit some of the interior sets where key scenes were filmed, never before opened to the public. See exclusive props and memorabilia from Coronation Street's history. Get a first hand insight into how the show was made.